For your next patriotic American holiday event, dress up and transform yourself into the original First Lady of the United States of America, Martha Washington! The legendary wife of our founding father and first US President George Washington will make a great patriotic costume for girls and women who want to celebrate patriotic holidays like President’s Day or Independence Day. Or you can choose to look your best for Halloween. These Early American costume dresses are great for patriotic school plays, presentations, and special events. If you and your significant other need a couples costume, dressing up as Mr. and Mrs. Washington will be a fantastic and patriotic costume idea for the holidays. 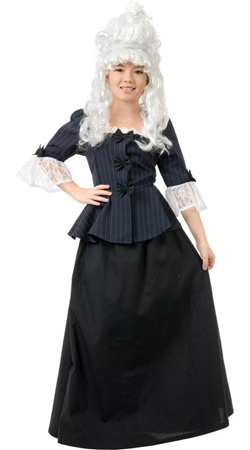 We found great sale prices and discount bargains on a variety of Mrs. Washington colonial dresses and white wigs for girls and women. 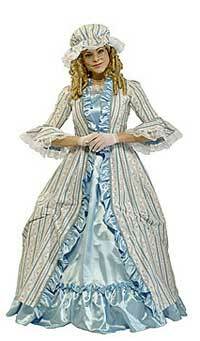 This adult woman’s Martha Washington costume is a premium quality outfit that features a beautiful blue satin under dress attached to an elegant and quality made overdress with lace accents, and a matching mob cap with lace accents. Available in women dress sizes: medium 10-14 or large (14-16). 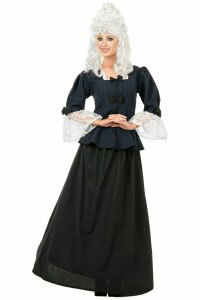 This historical colonial woman dress will make a great Mrs. Washington costume for your next dress up party or event. This dress is available in either grey or navy color and in sizes ranging from extra small to large for teenage girls and adult women. 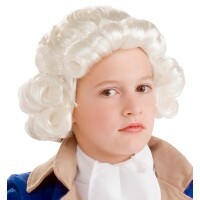 If you want to give your child a more sophisticated colonial style dress, this costume will be your choice. 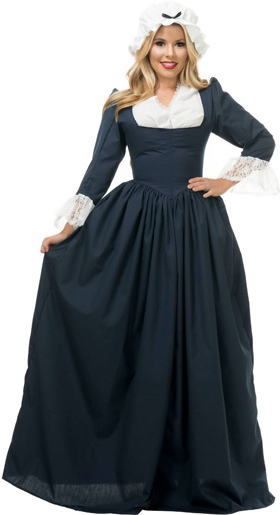 An attractive dress for school plays, colonial festivals, or historical reenactments! Available in girl sizes medium (8-10) or large (10-12). 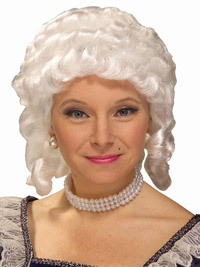 This fancy white colonial wig will complement your Martha Washington costume. 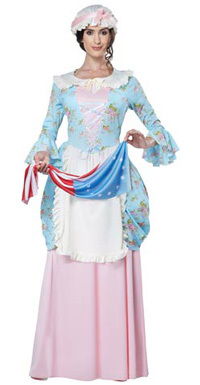 This attractive colonial lady outfit includes a pastel floral dress, matching mop cap, and traditional 13 colonies American flag. Available in multiple dress sizes for women. 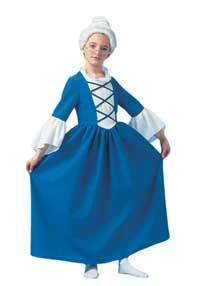 Stand out from the crowd with this lovely blue and white floor-length dress gown for young girls. Great for school presentations, plays, and Halloween. 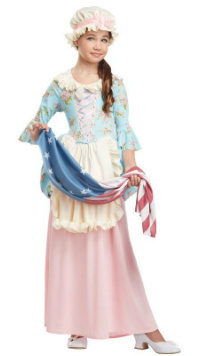 This is a beautiful child Martha Washington costume dress for girls which also includes the hat and flag. 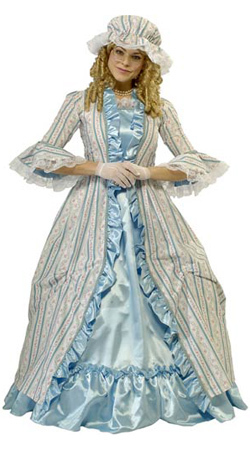 A nice attractive colonial dress with beautiful bows and ruffled white lace, ranging from size small to x-large for adult women. 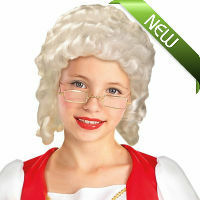 Accessorize your colonial dress with this fancy lady’s white colonial wig with curls. One size fits most adult women. 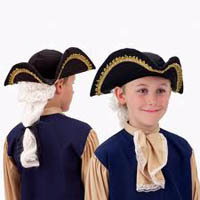 This child size white wig features short barrel curls. 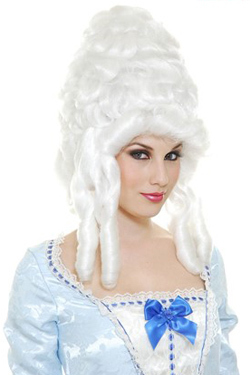 A nice affordable wig to accessorize your costume. Posted in Early American Clothing.